I like combining traditional ingredients (Southern USA, in this case) in untraditional ways. 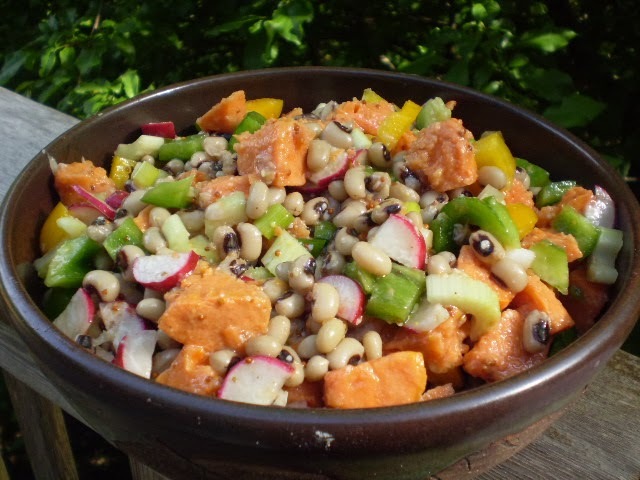 This combo makes a delicious, fiber-and-nutrient-rich, colorful salad, which can serve as a hearty side dish or a meal in itself. 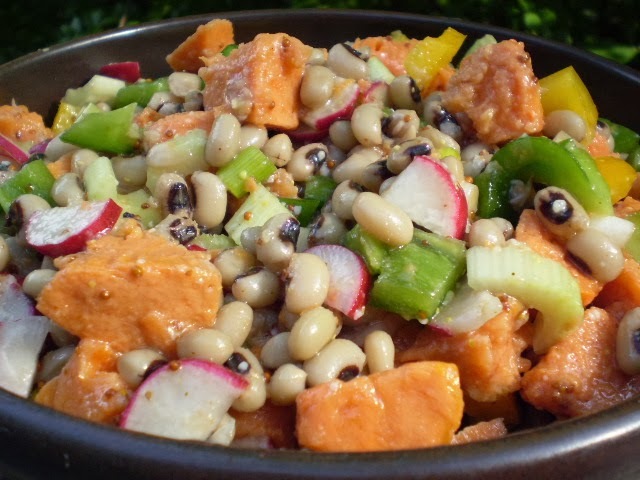 It's a wonderful hot-weather dish, of course, but it's also hearty enough for a winter salad and utilizes staples you might have in your kitchen during cold-weather months. The zingy dressing is practically fat-free, too. Whisk, blend or shake all of the Dressing ingredients together. Mix the salad ingredients in a large bowl. Add the dressing (you may not need it all, but add more than you think you need because it soaks up some of the dressing) and stir well. Refrigerate for several hours and serve with crisp mixed greens. Nutrition (per serving): 304.0 calories; 22% calories from fat; 7.7g total fat; 0.0mg cholesterol; 327.1mg sodium; 715.0mg potassium; 51.6g carbohydrates; 10.6g fiber; 10.6g sugar; 9.6g protein, 5.9 points.